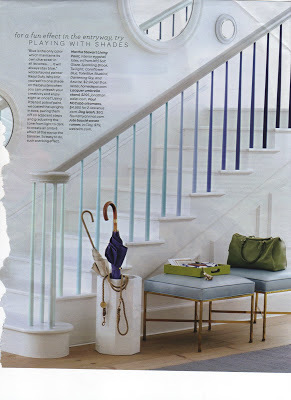 I saw this eye-catching paint treatment to a banister in Martha Stewart Living and ripped it out for my “dream home projects” folder. It wouldn’t well work on our current banister – the lighting is too dim and I think you need a bright entryway like this one to pull it off. Perhaps some of you have the perfect entrance way to try this out in! Even though a lot of colors are used to get this ombre effect, the project can be pretty cheap if you buy the small paint samples for about $3 a piece. This example used 8 different colors (each color used on two adjacent rungs) – so it was less than $25 to change up the whole look of the entryway. Pretty cool if you ask me!